What a great result - 14/1 winner at Leicester and 23.5 points profit on the race. Jockey timed his run perfectly this time... The other selection would have been second if it hadn't missed the break. Bajan Bear hasn't won for two years but he nearly did last time out when I blogged him ew at Salisbury. Arguably he made his move a shade early then and was collared close home. I think he is worth another chance at 14/1. I may have a bet in the last as well but not until the above race has finished. Will post at an appropriate time if I do. Not getting too involved today. Don't fancy anything at Goodwood or Galway. I may play at lowly Leicester but want to see the first race before deciding. I will post between 18:15 and 18:45 if I am having a bet. 14/1 poke Brown Sugar got things going nicely today. (Won 8/1). Bondi Beach Boy was very heavily backed at Beverley - lead all the way but just lasted home. We took 4/1 but this was subject to a 20p rule 4 which means a payout at 3.2/1. The Goodwood sprint handicap was no good at all with the main selection, backed from 14/1 to 9/1, finishing 19/20! Over at Galway Sophie's Echo got up for third (beaten two heads) for a 10/1 place (less a 10p rule 4). So stakes today: 13.50 - returns 32.77 - profit 19.27.The figures do not include an almost certain two point loss on Hanagan to be top Goodwood jockey. Let's give him a day or two to catch up before we write him off! There may not be much tomorrow but will have a look later. Sweet start to the day..
Looks like a bum steer on Hanagan - two non-runners in first three races is not the best of starts. Hopefully sweet success of Brown Sugar @ 14/1 has made up for that...winning day whatever happens now. Total above 11.5pts. That should be it today if no non-runners selected. Hughes and Moore are the obvious choices for top jockey honours at Goodwood, however I think Paul Hanagan could give them a run for their money (and for my money). He has six rides tomorrow including two "paper" favourites and has attractive rides for the likes of Roger Varian and Richard Fahey throughout the week. Six points staked. Please not that bigger prices are available as I write with bookmakers who will not take my bets - like Stan James and Vic Chandler. What a result today. Thought I was massive odds-on to lose this week following a disastrous Weds/Thurs. But then, tackling the hardest race of the day - the 29-runner handicap at Ascot, we land the spoils with Galician winning at 33/1. Not only that but the other selection in the race finishes fifth to reward our ew bet which was intentionally struck with Paddy Power, one of the few bookmakers paying out on fifth place. Consequently the return on the race was 52.25 pts meaning 37.25 pts Saturday profit. This puts us around 10 points up since Monday with Ascot to follow again tomorrow. Possible additional bet(s) at Ascot, if so will be posted by around 16:00. Also will consider Lingfield/Salisbury and post by around 18:00 if having a bet. Ten points staked. Thirsk in the morning. No further bets today unless any of the selections already advised do not run. Small profit. In the 19:30 Secret Empress, having been backed into 8/1, drifted on course back out to 12/1. Couldn't win but got second behing the odds-on shot to land the forecast (£10.84) and four points back on the ew part of the bet (BOG). Blow out in the last. Once again advised prices available right up until 20 minutes before the off and then the two selections were heavily backed on course: 4/1>9/4 and 12/1>5/1. Six Wives missed the break and never recovered. Come On Dave tried to make all finishing fourth, beaten a neck for third place. So nine points staked today, returns 14.84 points. No bets on Tuesday's racing but will probably be something from Leicester and/or Sandown on Wednesday. Interesting day's sport yesterday. I played the Curragh jackpot - not a big perm, just 2x2x2x5 - but went down in the first leg. It was nonetheless a value play as the dividend was 6,273 whereas the same bet at SP would have paid 1,782. Hope you got it! The golf though was brilliant. Phil said even par for the tourney could win it and, in fact, had he scored 69 he would have been in a play-off with Stenson, both finishing on that score. Fortunately for Mickleson backers he shot a brilliant 66 which led to a clear win by three shots. I thought Westwood would feel the pressure eventually but was beginning to worry when he went odds-on with betfair. Still it all turned out OK in the end and the small interest in the golf produced 35 points profit! Terrible day with the horses. In particular very disappointing results at Lingfield where my selections were heavily punted - generally after the racecourse market opened - but not one even finished in the frame. We must look at the overall situation after such a set back. We are still nearly 300 points up for the flat season which is the lion's share of nearly 400 points up for the calendar year. No horse bets Sunday (maybe something Monday) apart from a possible stab at the Curragh jackpot. Obviously no point in me telling you what I am going to put in my perm because - in the very unlikely event of my landing a share of the pool - anyone copying my selections would just reduce the potential dividend! You might like to have a look yourself though as there is a huge carry-over and the tote jackpot comprises just four races (races 3-6). I have an excuse now to get involved in the final day of the golf. Last year, at this stage of the tourney, I suggested two players: G-Mac (9/2) and Big Difficult (25/1) and it was of course the latter who came from six shots back to win it. Well there are 18 players to choose from within six shots of the leader. However the market is very much centred around Westwood (2/1 best) and Woods (5/2). There are negatives about both players: the former has been labelled as a bit of a bottler as he has never won a major and has the highest number of top three major finishes (seven) amongst players without a major win. On the other hand Woods, a prolific winner of course, has not won a major for five years. Of the 14 he has won, he has never been lower than a share of the lead going into the final day. (He is in the penultimate group two off the lead). A top three place would give eight points back for six profit. Not a huge bet but will provide an interest should it be too hot to go outside! Friday wrap - saving the best 'til last! Thought it was going to be an iffy day when my first two selections both finished second. In fact there were no returns until the last race advised. And then - bang - a 1-2 with Rodrigo De Torres winning at 22/1 by a short-head from Fast Shot at 20/1. This was the only race today where I suggested two horses and I know that some blog readers favour a reverse forecast on these occasions. If you are lucky enough to have done that you will have copped 389 points for your 1pt reverse forecast. If not, you've done pretty well today anyway with 15.5 points profit to advised stakes. More action tomorrow! Better late than never - or perhaps not! In the end it was four points loss on the day. Our ew selections held out most hope for a winning day with Dancing Cosmos on the premises (5th) backed from 12/1 to 15/2. But the nearest to an additional return was fast finishing Fidget (25/1>18/1) beaten just a head for third place. Let's hope for better luck tomorrow! Took 2/1 about Ghasabah, thought that was a fair price as it had been 13/8 with WH, Lads etc overnight. It has just powered in @ 11/4 and as we are on the BOG we get paid at the SP. So 15 points of our investment of 19 points returned with the first bet. Five further selections running for us now with a maximum downside (on the day) of four points. One more winner would do! Had no time to finalise the horse selections as have been watching the golf. No, not true, have had a preliminary look at Leicester, Hamilton and Doncaster. Going to play tennis right now in the heat so if I survive that I will post again before 1pm. I've got chances as my opponent used to be my GP! No bets today. Probably some action on Thursday. Staying clear of the golf to concentrate on flat racing. The problem with the Open at Muirfield is that it's too open. The last time it was played here there was a four-man play-off and 13 players finished within two shots of the winner. Tread carefully, therefore, with bookmakers offering each-way bets on first seven or eight. It will be very difficult to pick a golfer to finish in the "frame" and what's more the win prices will of course be shaved. Good luck if you play. Good start to the day. The two selections given early - on Monday night - both won: 9/4 (SP Evs) and 3/1 (SP 9/4). Chocamoca also obliged - @ 6/1 (BOG). Sir Geoffrey has just been beaten a neck @ 9/1 with Edith Anne fourth which is rather annoying. Tonight's two selections in the last at Kempton don't appear to have a prayer according to betfair (both over 50.0 to win) so I shall be extremely surprised if either is placed. Assuming that is the case we will still finish half a dozen points up on the day. Sandown tomorrow but the card doesn't look great. Will take another look in the morning. Both selections last night have been backed further. The first one is now only 7/4 and must have a good chance - top weight in nursery, dropped in class, headgear for first time etc. Value at 9/4 but not 7/4. I will be disappointed if one of the above does not win. More tomorrow. Back from my eight-mile walk in the Shropshire sunshine. In fact I was back in time to watch the 13:55A race. I didn't think Long Awaited had got up for fourth but, as they say, every little helps. If the above selection is unplaced the profit on the day will be 10.75 points. It's been a very good week. Since Monday we have had a 16/1 winner, two winners @ 10/1 and also a 9/2 poke that obliged. Long may it continue! Next bets unlikely to be before Tuesday. More from Ascot and this evening's meetings this afternoon. Another profitable day thanks to the day's best bet leading all the way at Chester and therefore scoring at 9/2 (SP 4/1). Looks like a busy day tomorrow. I am interested in Chester, Ascot, Salisbury and Hamilton. Two afternoon meets, two evening. I am going for a very long walk in the morning so will probably deal with the first two meetings around 9am (before I go). Then - if I survive the walk - I will deal with the other two gaffs early afternoon onwards. Let's see how the above selection gets on before placing further Ascot bets. Had a look Ascot and Chepstow. Definitely no bets at the latter. Still considering Ascot. The COC has watered however, so I would like to see how the track is running before I get involved. Therefore I will watch 14:00 race and post shortly after that if I have a bet in a later race(s). Great end to the afternoon yesterday when Robert Winston turned up at Doncaster for one ride. He came with a storming run on Sleepy Blue Ocean to land my 16/1 poke (SP 11/1). After drawing a blank for a couple days this was a welcome return to the winners' enclosure. Plenty of fancy prices available throughout the day with 16s available with several firms and even 21.0 on betfair. No crisps last night: carpaccio (local beef) with parmesan shavings, grilled scallops with cauliflower purée and (local) black pudding, Sauvignon Blanc. 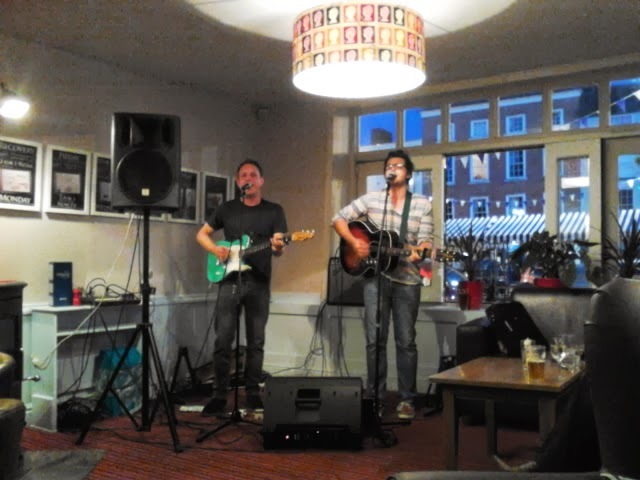 Live music followed at The Marches pub supplied by (friend) Benet Walsh and Sam Thomas. Wye Valley HPA and Salopian Oracle beers were consumed. Well why not indulge when the winners are coming in? Next week it might be "bread and point". A war-time expression of my father: meaning just bread to eat whilst pointing to meat elsewhere. I will be looking at Ascot and Chepstow over the next hour or so although there is a possibility of no further bets. Will post before 13:00 if there is any more action today. Meanwhile more tea required! In the Wolverhampton race Little Jimmy Odsox was backed from 9/1 to 11/2 and was beaten half-a-length. In the Pontefract race Kolonel Kirkup was a very warm order - backed from the 8/1 I took (win and place) to 11/4. It was subsequently put up ew by a major internet tipster @ 6/1 but unfortunately did not break well and could only finish fourth. Total 4.5 points. Wolverhampton to follow. A quiet day but a successful one. Very strange market at Ripon for this last race. The market initially wanted District Attorney which was backed down to 5/1 with one company this morning. Yet later in the day both my selections were available at bigger prices - 12/1 or greater. Once the racecourse market opened Border Bandit was all the rage and was punted from 10/1 to 6/1. For whatever reason the whole of the track must have been on! Why do I say that? Look at the tote return - £3.60 - 5/2! But we were on at 10/1 so that was juicy! After a grumpy Friday I bounced back today with a reasonable profit. I was so annoyed at my performance yesterday (despite the small profit on the horses) that I was up before 7.00am today to analyse the five cards that were of interest. In the end I could only narrow it down to eight races. Thankfully these produced three winners: w9/2, w9/2 (10p r4) and w4/1 plus an ew second at 14/1. Profit on the day 20.6 points. Time out tomorrow despite racing taking place at one of my favourite tracks - Bellewstown! Won't see you on the hill (unfortunately). Tennis (playing) in the morning followed by tennis (watching Mugray) in the afternoon. Feel in a better mood now having been out in the sunshine! Wasn't too bad a day yesterday as another reader informed me. After all we had the one-two in the Sandown sprint and this chap had the foresight to land the reverse forecast which paid £44! That's it for today. Hacked off with the tennis: opposing Djoko and Mugray. At least it was only for small money but it was very close in the Djoko match. At least you lucky VC punters will have your stake (on Delpo) back as a free bet as he lost in the fifth set. The tennis, however, has been a distraction to the main task of finding horse winners. I won't bore you with the details but it definitely cost me yesterday. But that's it for Wimbledon. In the ladies' final I hope Lisicki wins as she deserves it most having defeated the numbers one and four seeds. Plus Bartoli is just horrible. In the men's it's an even call. I'll be cheering on Mugray now (having opposed him in the last two rounds) as I no longer have any financial interest. Terrific tennis in prospect. Going to take an interest in the first match. Both Djoko and Delpo have not dropped a set coming into their semi-final match. This is a remarkable stat for Delpo as he was badly injured after a few points of his match against Ferrer. Yet he recovered and came through. The H2H is 8-3 for Djoko so one could be inclined to think that this will be straight forward. However Delpo won their latest encounter and also won their only match on grass, Delpo beat Djoko at the Olympics last summer to earn the Bronze medal, in itself a great recovery as he had gone so close to putting out Federer to earn a place in the Olympic final. So no doubt we can expect what everyone is predicting - a Djoko v Mugray final on Sunday! At least one more racing post in the morning. A poor day today. Particularly disappointed with Flipper's performance. Possible further bet in above race tomorrow. May also have a bet at Doncaster. Anti-Mugray bet for tomorrow. Reckon Andy's feeling pretty stiff this morning! The big fella maybe a bit one dimensional against the inventive Mugray but I give him a chance at a fraction over 4/1. Meanwhile I'll be cheering on the Flipper to take out the unlikeable Bartoli tomorrow. Let's hope she can do it. Unfortunately I don't think I will be able to watch the match live. Haydock could be the place for a couple of wagers in the morning. One other observation about Mugray during his last match was his second serve. Why is it so frequently landing half way up the service box? Surely this is going to be a major problem unless it is rectified soon? If one of his next two opponents can't capitalise then should he meet Djoko in the final he would have no chance. I see that you can lay Mugray @ 2.76 on betfair for the tournament. I think he will be at least that price if he is up against Djoko in the final. But he has two more matches to play yet. There is a remote possibility that Berdych will take care of the Serb tomorrow. That would certainly suit my 66/1 wager on the Czech. A lot still to play for. I'm not a layer - I'm a backer - but IMO Mugray is poor value @ 7/4 to win this tournament. No bet recommendation though. Should be good viewing tomorrow as the way the OOP is structured we should be able to see the Djoko match on court one as first match on followed by Mugray as second match on centre. A good day with just two horse races played and a juicy 8/1 winner in the first of these. Although this was a late posting I did say in the 12:42 post that I would be posting between 16:30 and 16:45 and the post for the 17:00 race was duly made at 16:43. Sometimes you have to have a good look at the way the track is running before stepping in. Tomorrow I will be interested in the evening meetings at Kempton and Chepstow. In the tennis Li Na couldn't win against an injured A-Rad. She had copious set points in the first set and failed to convert. She let A-Rad back in and that was that. You have to say Li Na was a little unlucky as she aced A-Rad on set point in the first set and although the ball was called out the (unchallenged) replay showed that the ball was in. Flipper put in a great performance to beat (an unwell) Kvitova in three sets. Flipper made a total of just five unforced errors in the match and hopefully (although she will start second favourite against the unlikeable Bartoli) she will have a good chance of reaching the final. Looking at the match prices now Flipper is a best priced 11/8 to beat the Frenchwoman and was 2/1 to beat K-Vit. So the double match result was effectively just over 6/1 and we have just under 12/1 as the place part of our 35/1 bet on the Belgian. So that is a 9.5-1 chance after betfair commission. A good day yesterday with Lisicki beating Serena in the only match bet advised so far during Wimbledon fortnight. The 37.9 points profit on the match (after betfair commission and deduction of the 2pt 2-1 sets saver). At least this pays for my quarter win bets and the ew selections which have already lost. 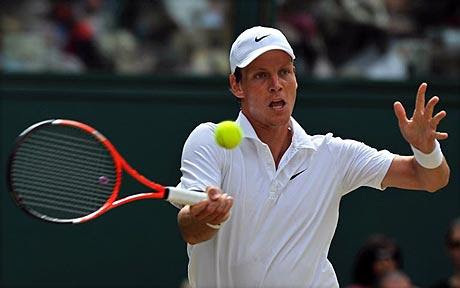 In terms of Wimbledon bets still running, Berdych is still in there @ 66/1 ew but plays Djoko tomorrow who is in excellent form. In terms of the Women's event - which looks wide open now - we have Li Na @ 33/1, a bet placed in January with Paddy Power when she was going through a hot streak. I gave up on her after the French as still too mentally fragile. Incredibly she is no better than a 9/2 shot this morning for the championships. Flipkins plays Kvitova today for which she is no better than 2/1 and holds a 1-0 HTH with K-Vit. If successful she would then play the winner of Stephens v Bartoli for a place in the final. With the ew we are getting nearly 12/1 about that happening on the ew part of the bet. If I have a bet on the horses today I will publish it on the blog between 16:30 and 16:45. Talent Scout led all the way to win the selected Pontefract race yesterday.